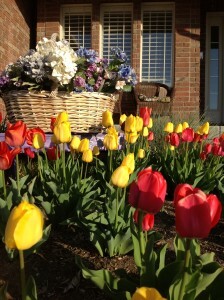 Tulips are a free gift every year! 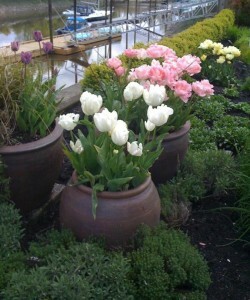 No matter how tired you are of planting this fall, make sure you create for yourself a tulip garden. They are a wonderful way to celebrate your efforts of yesteryear. And no matter how many springs come and go, I am always surprised by the splendor of these florae! Follow the directions from the supplier for spacing and depth. 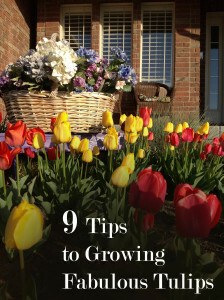 If no directions are included, plant the bulbs 6-8″ apart and at a depth twice the diameter of the bulb. Something I have never considered, is planting them in pots and then storing them in the garage to allow them to winter over and then bringing them out in the spring to place them anywhere you want for that splash of springtime color! I love this idea!! Tulips! A free gift to me every spring.